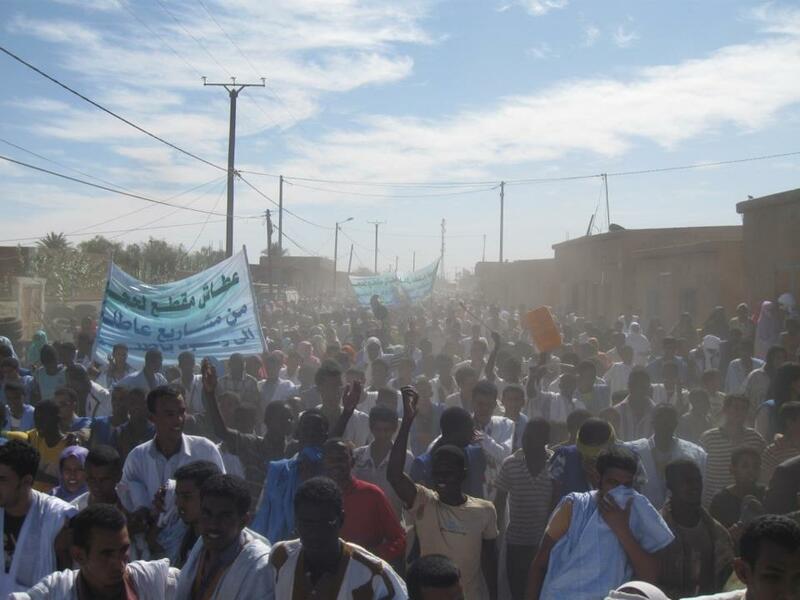 Mauritania is experiencing a vibrant protest movement touching many sectors of political and civil society. Each day seems to bring fresh reports of demonstrations or rallies, sit-ins or gatherings. A member of the 22 states that make up the Arab League, with a complex mix of issues stemming from political, social and financial inequality, Mauritania was naturally caught up in the wave of uprisings that have swept across the region since 2010. Mauritanian businessman Yacoub Oluld Dahoud who self-immolated in January 2011, leaving a note to explain his motives were to liberate his country from oppression. In the case of Mauritania, a middle-aged businessman named Yacoub Ould Dahoud burned himself in front of the Presidential Palace in Nouakchott on 17 January 2011, imitating the action of Mohamed Bouazizi in Tunisia. Yacoub’s attempted suicide set off a round of protests in the capital which began before he died in hospital on 23 January. The protest movement continued to grow, peaking for the first time on 25 February 2011 with a large street protest in the capital, Nouakchott. That day prompted a civil society opposition group that had been active since January to adopt the name “February 25 Movement“. This group remains at the forefront of non-violent civil society activism in Mauritania, despite constant pressure from the authorities, police repression and arrest of protesters, and occasional competition from other groups of various stripes, seeking to dominate the scene. In the months that followed that debut, the culture of protest evolved and diversified with further large protests, most notably on 25 March, 25 April, and 24 May. In late March-early April 2011 there was a schism, as a new movement – “Don’t Touch My Nationality” (TPMN) – emerged in response to the national registration programme, which became deeply unpopular among that half of the population descended from black Africans. The issues centred around the insensitive and inequitable methods used by authorities to prove nationality, with the implication that they were deliberately trying to exclude citizens on the basis of their skin colour. 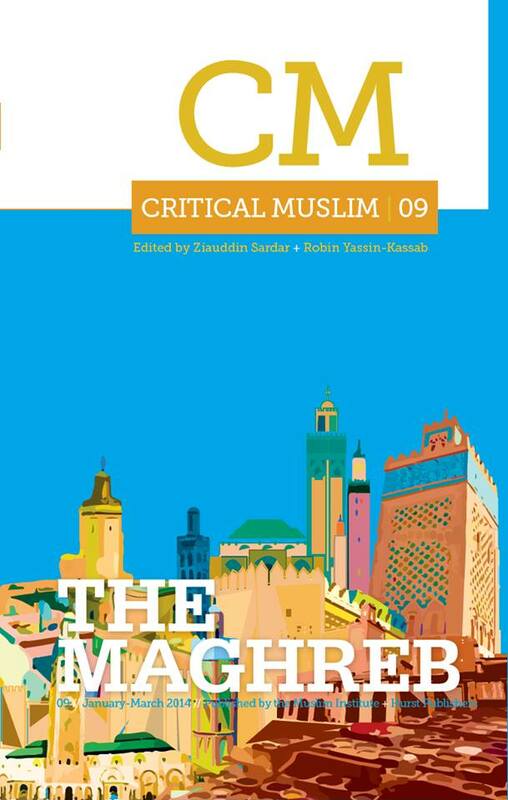 This exposes wounds in Mauritanian civil society that are yet to heal: inequalities attributed to racial discrimination; the failure to eradicate slavery; and a series of events up to and during the Mauritania–Senegal Border War of 1989-91, when tens of thousands of black African citizens were forcibly expelled and still unknown numbers were massacred. There were aggressive actions during several TPMN protests in 2011, including an incident when a police vehicle was destroyed, and arson attacks on the courthouse and census office in Kaédi. The response to TPMN protests by police was immediate and more brutal than previous protests featuring more “white” Arab participants, which only lends more weight to the claims of discrimination. Another group that has been highly active on the protest scene are the Islamists. Using the communal nature of worship and education to advantage, Tawassoul and it’s many online incarnations have had a very busy protest year, showing a preference to act independently, and with a penchant for selecting protest dates one or two days ahead of events announced by other groups. They are also incredibly persistent, especially on FaceBook, where links to every event or update are posted dozens or even hundreds of times. The drawback here is that their actions are sometimes seen as inconsiderate and aggressive, at odds with the more genteel Mauritanian disposition. This aggression spills onto the streets at times, as with ISERI students, for example, frequently pelting police with stones, and burning tires to block the road and stave off the effects of tear gas, which is used liberally by the riot police. Protests continued throughout 2011, accompanied by relentless pressure from the regime to disrupt any opposition; a violent crackdown that saw one youth shot dead and several people seriously injured during TPMN protests, including a young rap musician; smear campaigns, arrests and persecution of activists; and the emergence of several copy-cat movements. With less than 3.5 million people spread unevenly across a million square kilometres, and incomplete mobile or land line coverage, communications can not be taken for granted. For lower income families – the group most affected by social issues and therefore most expected to attend mass protests – poverty and low adult literacy complicate communication efforts still further. All this weighs heavily against civil society organization and can prevent a movement benefiting from natural momentum without significant and sustained effort. Seeing the benefit of increased cooperation, and identifying the need to engage and educate people in the principles of non-violent opposition, the February 25 Movement organised a number of alternative events during the latter half of 2011. They also invested time in refining their strategy, consolidating the core membership through a recruitment drive, and reaching out to other groups. Despite very low internet usage in Mauritania, estimated at less than 3%, the movement maintains an online presence with a website and through social networking platforms such as FaceBook and Twitter. The recent introduction of support for right-to-left languages and hashtags on Twitter has definitely enhanced this experience, and we can already see increased interaction and mutual support between Mauritanian activists and bloggers and their counterparts in other Arabic-speaking countries. What all protest movements essentially seek to do is facilitate change by giving a voice to issues or shining a light on shady practices. Mauritania’s protesters are no different in that respect than those in any other country. Apart from the political opposition now also openly demanding the departure of Aziz, the narrative of protests has really not changed dramatically in over a year, but the level of frustration and dissatisfaction has increased steadily. The government has tried to stem this flow in many ways, some more subtle than others. It’s important to appreciate the depth to which corruption and cronyism is embedded within the Mauritanian culture: a job here, a loan there, an indiscretion or even a bigger crime ignored or covered up. In other words, there are myriad ways in which favors are bought and sold in exchange for compliance, obedience, silence, inaction. However, the appearance of several recent reports which expose major financial scandals could be an indication that people are finally losing patience with the lies and hypocrisy. Even a society that for generations has accepted bribery and corruption as a daily reality will eventually reach saturation point. Recent video of an altercation between health workers and the Minister of Health. Trade unions are legally allowed to stage protests but are prohibited from engaging in any political activities. However, any individual has the constitutional right to assemble in peaceful protest. (video of a women’s march against hunger and rising food prices). On 29 March a large group of Salafi women held a protest demanding an end to democracy and the implementation of Sharia law, which they believe would secure the release of imprisoned husbands or family members. The group are especially concerned about the fate of 14 missing prisoners who were moved to an unknown location some months ago that the authorities refuse to account for. By far the longest-running series of protests are those among rural and some poorer urban communities demanding either potable water, consistent electrical power, or for the least fortunate, both of these essentials. The town of Magta Lahjar is a prime example, where they are currently holding an open-ended sit-in to demand safe drinking water, which was promised to them several years ago and has yet to be provided. As protests in Magta Lahjar grew, and threatened to clash with a regional visit by president Aziz, over 50 young activists were rounded up on the night of Monday April 16 and detained. Boutilimit is just one of many towns that have protested against issues with electrical power supply after prolonged power cuts and intermittent outages. In Nouakchott last year there were protests against the lack of adequate drainage, which causes large areas to become flooded after heavy rain. Although public gatherings remain the most popular form of protest, two groups have recently held long distance marches in order to highlight their demands. The first covered almost 500km from Nouadhibou to Nouakchott, culminating in a meeting with president Aziz to present their list of grievances, which included several issues related to infrastructure and development. The second, in early April, was a hike from Mederdra to Tiguent, to demand that a paved road be constructed along the route of the 50km march. Food-related issues were a feature of protest banners and slogans from the start. Mauritania has a large agricultural sector, but still imports approximately 70% of its food. With supplies diminished by a particularly severe drought last year, and 23 consecutive increases in the cost of motor fuel driving imported food prices even higher, there have been numerous protests about this situation in the past 15 months, many of them outside of the capital. Since the announcement of the government’s “Hope 2012″ drought relief project there have been several occasions where communities have protested against the allowances of feed for livestock, inefficient management, delayed distribution, or inadequate supplies. Meanwhile, flash floods in March killed thousands of heads of cattle, exacerbating existing food insecurity and dealing a tragic blow to herdsmen who had somehow managed to keep their flocks alive despite the drought. At the end of 2011 a series of protests and sit-ins began at the Islamic Institute “ISERI” in Nouakchott, in response to rumours that the government was planning to close the college and move all students to another school in a more remote location. When the principal failed to open registration it provoked an angry response. Students crowded outside his office and the riot police were called to the scene. The brutality of their assault on the students only inflamed the situation, and even after a promise to keep ISERI open, registration is still closed and protests and examination boycotts have continued, as have the attacks by police. 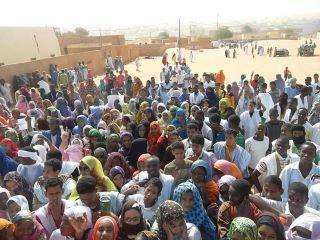 In addition to the ISERI protests, students held strikes and sit-ins at the university in Nouakchott. Again they were met with a violent response from police. In March 2012 high school students added their voice to the rising tide of protest from the education sector. It is not only students who have taken action. A series of protests and a strike by teachers resulted in the government deducting one month’s salary from all who took part. As the teacher’s union is legally registered, strikes are permissible, and the loss of pay has prompted protests and a call for further action. The political opposition is increasingly divided between those who are willing to engage with the majority party in government and a coalition of parties referred to as “COD”, which refuse to deal. COD has become increasingly active in recent months, beginning with a boycott of further dialogue, which is routinely resurrected by the ruling regime as a panacea for all political ills. In March 2012, after a tour of the country’s major towns, COD called for a march in Nouakchott, billing it as a “defining” moment. They were not disappointed. Tens of thousands took to the streets to join the march, surpassing all expectations and marking a milestone for the opposition, which is now demanding the departure of Aziz. The regime experienced a further blow when a pro-government rally the following week in the second largest city, Nouadhibou, failed to generate the same level of attendance despite supporters being ferried in from outside the area. At the start of April nine member parties of COD each called for simultaneous marches in nine separate districts, and again tens of thousands turned out. The opposition is now on a path of confrontation with the ruling party and Aziz in particular, determined to see his ouster. This in turn is boosting and revitalising civil groups. 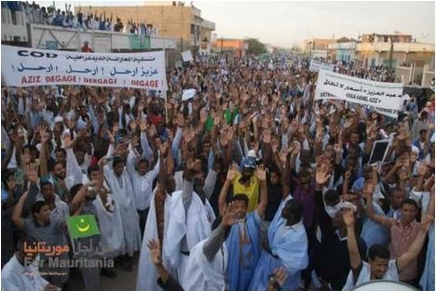 We could say that protests in Mauritania have gone viral! Mauritania is the most Westerly of the Arab States. Sitting on the edge of the African continent, with the ocean as it’s Western boundary and the vast deserts of the Sahara to the East, Mauritania has not often made headlines since the days of the Paris-Dakar Rally, which came to an abrupt end in 2008 because of a “terrorist threat”. From that point, the big country with its tiny population faded from the mainstream news and drifted into the shadow realm of international security reports featuring Al Qaeda. That same year saw the latest in a succession of military coups d’état that have punctuated the political landscape since gaining independence from France in 1960. With tourism revenues almost wiped out, the suspension of international funding in response to the coup was devastating for the economy, and popular protests called by political opposition leaders erupted in response. Almost four years later, tourists are still extremely rare, and funding – although largely restored – is rarely perceived as benefiting civil society. It is in the area of regional security that the Aziz regime has invested the majority of it’s time and resources, to the detriment of social welfare and economic development. For anyone wishing to follow events in Mauritania the first difficulty is in identifying sources. This fairly comprehensive list of websites and FaceBook groups created by a student from the University of Leicester may be of help. As always, the problem with directory lists is in keeping them updated, and new sites and groups are appearing every week. The second difficulty is the language barrier for those who do not read Arabic or French, as English or Spanish language sources are few and far between. I try to maintain a steady flow of news on this blog, which you are welcome to follow and comment on. I personally think your blog is a very great place to be updated about the events happening in Mauritania. You are doing a great job. with all my heart hope your movement will have big succes ….and change the world a little if you can..